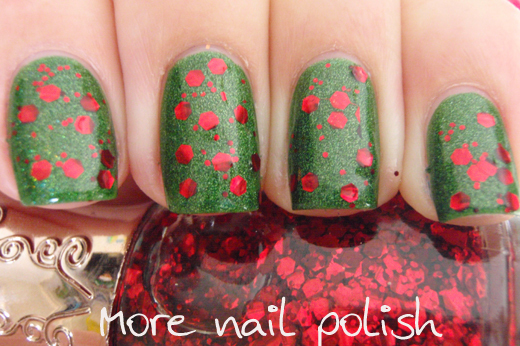 Here is my latest holiday mani. 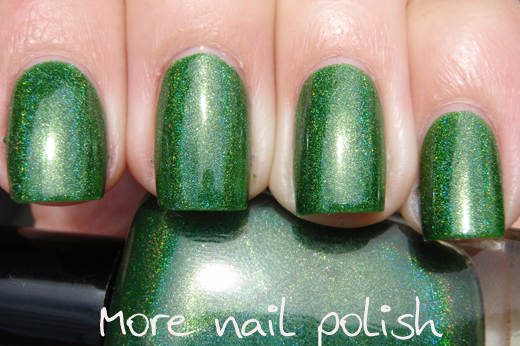 The base is a new custom polish I made, which is a few shades darker than the Fairway Green polish I made. 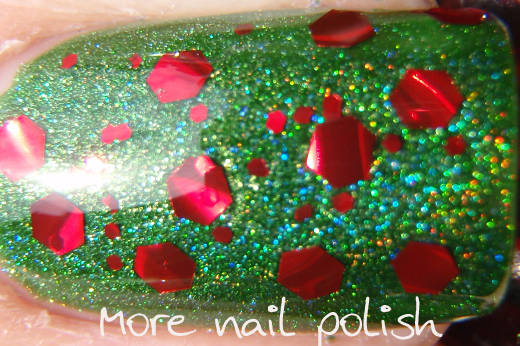 I called the polish Holo holly. And of course I had to add some red to make the holly complete. I put one layer of JQ red glitter which I bought of ebay earlier this year. It's strange glitter cause each piece curls slightly, rather than laying flat. 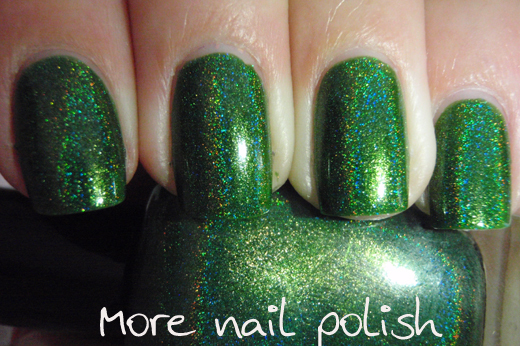 Seche Vite smooths it right out, but the bends in the glitter make it look rough. Here is Holo Holly on it's own. Unfortunately there was no sun, so I took a few photos with the macro LED light to show the holo off. And on a non-nail relate note: Mum said I must have killed a china man, cause we've had some rotten luck over the last week or two. My husband dislocated his shoulder on Saturday night during a baseball game, bye bye season for him! My son tripped up the stairs and smashed his front teeth on the tiles, chipping the front of one off and pushing it right back up into the gum (poor little fella) Our pool solar heating has gone kaput and I spent $100 on a new probe and it still doesn't work. And today our TV started going brrrrrr, brrrrrr, brrrrr and wont even turn on. Come on, enough already ok!! 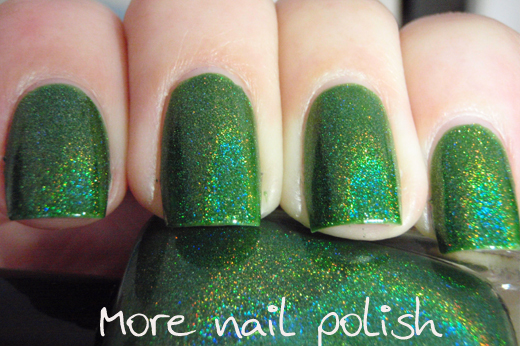 Aaah I love that polish.. Can you email me the recipe!??! 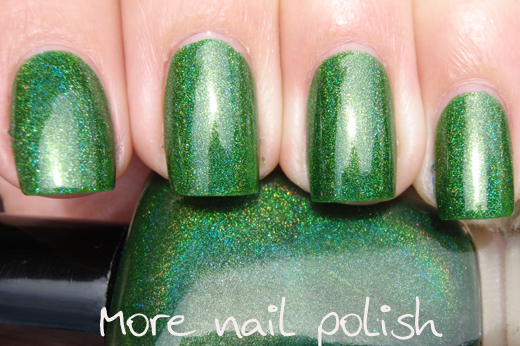 I've been wanting to make a dark green holo but every one I make turns out olivey in colour! I'm sorry you've been having such bad luck :( I hope it all gets better soon!!! wow I love that green! Isn't bad luck meant to happen in threes? You've more than had your share. I seriously MUST have that Holo Holly! Super pretty! 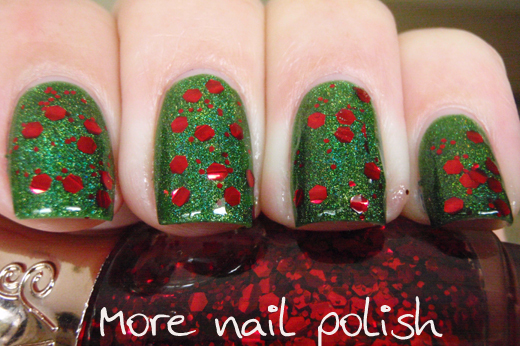 Like the most ultimate Christmas manicure! I'm sorry your having such bad luck :((( Hope everything gets better SOON! 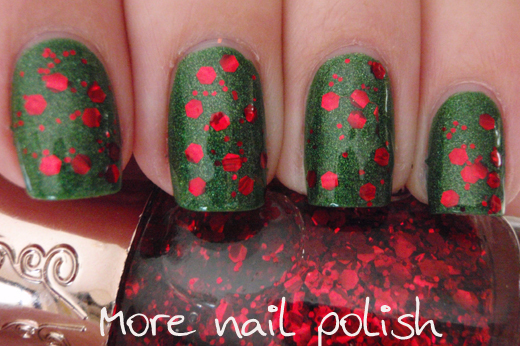 What an interesting 3D effect with that red glitter. I hope no more bad luck comes your way. This is beautiful! Sorry to hear your having such bad luck :( hope things turn around soon. STUNNING, as always! You mix up such gorgeous greens! ..I'm surfing in the internet and came across your blog. ..I'm quite impressed , with how it makes such good reading.